Growing potatoes in your garden can be lots of fun. With the variety of types and colors available, planting potatoes can add interest to your garden. 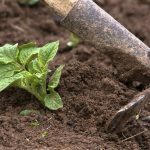 Learn how to grow potatoes and when to plant potatoes in your yard with these simple steps. When growing potato plants (Solanum tuberosum), it is important to keep in mind that potatoes are cool weather vegetables. The best time when to plant potatoes is in early spring. Planting potatoes two to three weeks before your last frost date will produce the most satisfactory results. A growing potato is an undemanding plant. They need very little other than mild temperatures and soil, which is why they have been a historic food staple. Planting potatoes normally starts with a seed potato. Seed potatoes can be prepared for planting by either planting whole or cutting up the seed so that there are one or two buds or “eyes” on each piece. Straight in the ground – Farming operations and large plantings of potatoes are normally planted this way. This method for growing potatoes means that seed potatoes are planted 1 inch under the soil. As the growing potato plants get larger, the soil is mounded up around the plants. Tires – Many gardeners have been growing potatoes in tires for years. Fill a tire with soil and plant your seed potatoes. As the growing potato plants get larger, stack additional tires on top of the original and fill those with soil. Straw– Growing potatoes in straw may seem unusual but it is very effective. Lay out a loose layer of straw and put the seed potatoes in the straw. When you see the growing potato plants, cover them with additional straw. Much like when to plant potatoes, the best time to harvest potatoes is when the weather is cool. Wait until the foliage on the plants has died back completely in the fall. Once the foliage is dead, dig the roots up. Your growing potatoes should be full sized and scattered through the soil. Once the potatoes have been dug up from the soil, allow them to air dry in a cool, dry place before storing them.